Core weakness and its consequences contribute to many complications in pregnancy, labor, delivery, and birth recovery. Understanding the physical demands of motherhood is the first step in preparation. There is a group of muscles that encircle the core (that area between your pelvis and your rib cage) that are primarily responsible for holding you up. 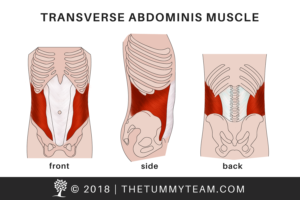 The main muscle in this group – the transverse abdominis – is the only muscle in the body that wraps completely around the body to have a front, back, right and left aspect all in one. It is a natural corset. The function of this muscle (and other core muscles) is to hold you up. It elongates the abdomen between the pelvis and rib cage like a pulled slinky. When this muscle is strong and active, it is your major postural muscle, holds your organs up and in, and provides stability for your spine. A disconnection from your functional core muscles can cause your body to collapse, and force other areas to compensate in an attempt to support your body and the baby. The collapse can result in diastasis recti, poor fetal alignment, abdominal pain, pelvic floor issues, difficult deliveries, stop and start labors and herniated belly buttons. The strategies women use when compensating for this disconnect can cause pain and instability in the back and pelvis. A weak core in pregnancy foretells a weak core for delivery and a weak core postpartum. The Tummy Team approach focuses on those essential core and pelvic floor muscles during your pregnancy to provide support, balance, and stability needed throughout your pregnancy. But we take it a step further by specifically targeting the coordination and connection needed between your core and pelvic floor muscles for a smooth delivery and birth recovery. And then we give you meaningful strategies to continue to reinforce your functional core strength postpartum. This is the missing link between childbirth ed and prenatal fitness! Prenatal Core Rehabilitation is a systematic approach to rebuilding the connection and coordination of the core and pelvic floor muscles to effectively support the optimal mother and fetal alignment and functional strength required for a pain-free stable pregnancy, an uncomplicated delivery, and a speedy birth recovery. We have several different online prenatal core rehabilitation programs to meet your needs. Pregnancy, delivery, and recovery doesn’t have to be so hard. Let us help. The Tummy Team has taught me to appreciate my body and know it is capable of healing after having four babies. I did their program because it targets women with a history of difficult delivery. Doing it made me go into labor with much more confidence. This program made all the difference in my third pregnancy. I only wish I had this information with my first two! I went from crippling pain to an almost completely pain-free pregnancy. After being told by a doctor “that’s just how it is after you have a baby,” finding the Tummy Team was about finding hope and answers.